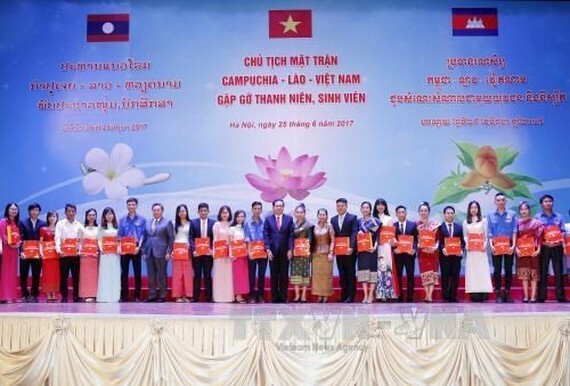 The Presidents of the fronts of Cambodia, Laos and Vietnam had an exchange with outstanding students from the three nations at the Vietnam National University in Hanoi on June 25. Opening the event, President of the Vietnam Fatherland Front Central Committee Tran Thanh Man stressed the necessity for the younger generation to keep the three countries’ traditional solidarity. He urged the youth to spare no effort to foster their capacity and do together more for their homelands and the tri-lateral ties. 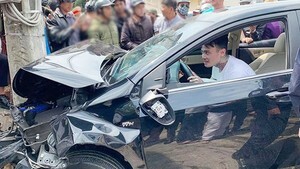 President of the Lao Front for National Construction Saysomphone Phomvihane asked the students, particularly Lao students in Vietnam, to support one another in learning. He thanked Vietnamese teachers for their assistance towards Lao students in Vietnam. On behalf of the participating students, La Thi Thu Hue, from the University of Languages and International Studies, showed her pride in the strong friendship shared among Vietnam, Laos and Cambodia. She pledged to work with her Lao and Cambodian peers to contribute to the relations’ growth. The exchange featured performances of signature music of the three nations.